I will never forget the sinking feeling in my stomach as I approached the black carpet for the Golden Gods Awards. 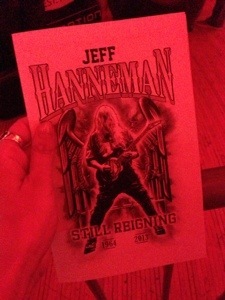 About an hour before, we had all found out that Jeff Hanneman had died. Not only was I in shock and mourning as a fan, but I began to empathize for those who I would soon be talking to that were his close friends. When it was announced that there would be a public memorial service for Hanneman, I knew that I wanted to be there, even though I didn’t know what to expect. What would it feel like to be amongst sad Slayer fans? 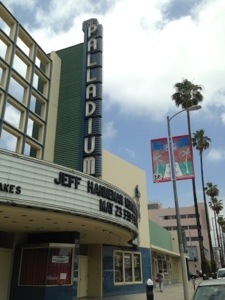 As I walked up to the Palladium and took a photo of the marquee, and rounded the corner to find my place in line, I was greeted with a sea of metalheads who had been waiting in line since the wee hours of the morning. They yelled “SLAYER! !” and changed to “METAL BLADE” to reflect the shirt I was wearing as I passed by. There were mini camps set up, like tailgating, and that was when I realized that as much as we were mourning, we were all celebrating our love for Slayer, as if once we entered those doors, we’d be seeing a show. I was there two hours early when I found the end of the line almost completely wrapped around the block at that point. I took a seat and took off my headphones to start taking it all in. It was a scene; I am so glad I went early to witness all of the crazy things that were happening in that line. From the cops in cars and on bikes who were circling the block like sharks, probably initially thinking that they would serve and protect against Westboro v. Slayer fans, but since Westboro were no-shows, instead ended up ticketing drinking minors and adults who thought downing bottles of Heineken would be a good idea. Then there was the guy on a bicycle who stopped and asked my line neighbors what was going on- empathized with the situation and showed his support by whipping out a container of weed and gifting a bud to them. And who could forget the guy wearing a hooded ensemble like a Nameless Ghoul and a guy with a TV on as a helmet. 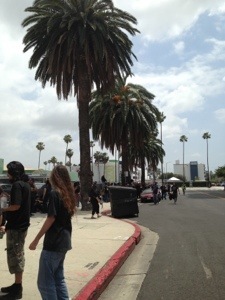 There were families with little kids in Slayer shirts. We watched and laughed as people would round the corner and realize just how monstrous the line was and freak out. 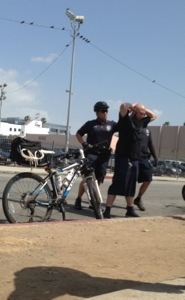 We would yell at the buses of Hollywood tours as they took photos and videos of us. And as we got closer to getting in, we watched the VIPs arrive: the bandmates, tour mates, family and friends who knew the person, while we only knew the music. As I entered the building and saw the way it was set up- like the most rock &roll funeral service ever- it all hit me. What was I doing here? Do I really even belong at something like this? I did not become a Slayer fan until late in life. Unlike many metal fans, who’s tastes mellow out with age, I walked away from the mainstream metal I listened to as a kid for most of my early twenties only to return and suddenly develop an appetite for the extreme. Slayer was part of that barrier that broke and hurtled me into an ongoing quest for the angrier, faster, and more evil. I used to write it off as being too much for me, sounding like adults in a Peanuts cartoon, until one day it was if I started speaking their language. And then I learned every record, went to every show. I would see Slayer so many times in the late ’00s that it began to feel like they would just always be there. Constantly touring, I felt like I always had a Slayer show on my calendar. Then came the spider bite, and the necrotizing fasciitis. The most metal-sounding ailment in the world, it almost felt appropriate, like a necessary part of their story. Hanneman would be off for a while. But then time started to pass, and he wasn’t back. And then there was the whole Dave Lombardo issue. And then we find out Hanneman is dead. I think for many fans, it was not just a loss of a great guitarist, but also the end of Slayer as we knew it. As the Palladium began to fill, we lined up along a barricade a ways back from the stage to allow for seating for family and friends up front. The woman next to me shared a story of going to see Slayer and Pantera while she was 7 months pregnant with her daughter- from a seat, of course- and how her daughter has always loved Slayer. I watched people around me sporadically yell the band name at each other; the two-syllable word is perhaps the most heavily weighted currency in metal. As the event began, we would hear stories about Hanneman from business associates and friends for about an hour. The exuberant fans would often yell out, and early on were instructed to change their chants from “SLAYER! !” to “HAN-NE-MAN!!!”. Sometimes the yelling was supportive: “WE KNOW HOW YOU FEEEELLL! !” or not, and in one case Kerry King shut this guy down with “is this your story or mine?!”. The guy would not speak again. One of the speakers mentioned how we should all be nicer to each other, and there was a murmur of laughter from the crowd. A girl next to me now had a bouquet of roses. As the event transitioned from speakers, including an ad hoc appearance from Shavo from System of a Down who talked about how Slayer were the first band that took them on the road, and we went into the video sequence. I’m a contagious cryer, but I’d held it together until the beginning notes of “Fade to Black” started and the photos of Hanneman’s life began to show. That was when I had some buried memories resurface, and the tears began to fall. In 2007, I lost my grandmother. The first show I had a week after that happened was Slayer and Manson. In 2009, I lost my grandfather, and hours after I heard the news, I was at a Metallica concert. And in 2010, I lost my mom, and the show I went to the day after my mom’s funeral was Slayer, Megadeth, and Anthrax. There were comments that I wasn’t mourning right. People have this ideal that you are supposed to surround yourself with family, to pray, to cry, to experience grief. I don’t work like that. Music has always been my medicine, my therapist, and in those years of numbness where I lost the three most important people in my life, somehow, Slayer (and Metallica) was there to help me feel. As the video soundtrack moved on to South of Heaven, we saw the photographs move from Hanneman’s childhood to the early days of Slayer to Slayer as we knew them today. And then the thunder struck and the room filled with “Raining Blood”. I was wiping away a tear when I was thrown forward towards the barricade, and I turned around to a full on circle pit of fans thrashing about singing the words. It was amazing. I watched the musicians in VIP smile and take photos with their phones. “Raining blood!!! From a lacerated sky!! !” we all screamed with our fists in the air. And in that moment I was so aware of the fact that even though I may not have been a lifelong metalhead, even though I’m new to this town, even though I didn’t personally know all of these people…we are so connected. These people are my family. As the event wrapped up, I bought a shirt to commemorate the night. And then we all went our separate ways, maybe never to be connected in the same way to Slayer again. But we said our goodbyes, we got closure, in a way that only we could. I think it’s gonna rain when I die, and I hope there’s a circle pit. For better coverage of the speakers, look here. My first concert ever was Slayer in 2002 @ The Universal/Gibson Amphitheater. They announced that The Gibson will close permanently this fall…then Jeff dies. The service was touching, the mood joyous and somber at the same time. One last pit for Jeff I suppose. Absolutely. That’s a great first show to have and I’m glad you could be there.